Udupi, March 23, 2016: Four members of a family from Brahmavar met a tragic end when the car in which they were travelling hit a track from behind at Mangarayachiwadi Cross in Kolhapur district of Maharashtra on March 22, Tuesday morning. 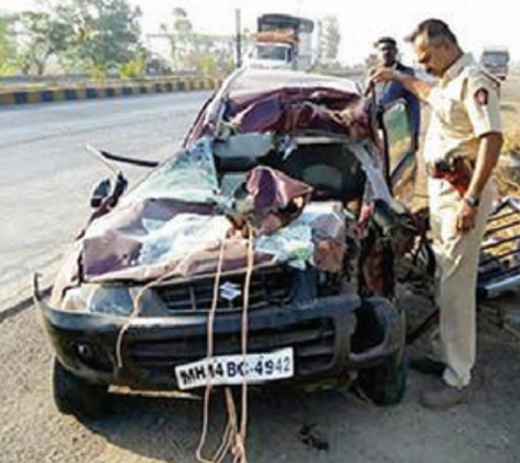 Those in the car were returning to Mumbai after attending a function in their hometwown. The deceased are Santosh Domba Devadiga (41), his wife Poornima Santosh Devadiga (35), the couple’s child Anisha Devadiga (4) and Supriya Datta Devadiga (36). The family of Santosh resided at Ghatkoper in Mumbai, while Supriya was a resident of Pune. Another person in the car Datta Vittal Devadiga (45), who sustained serious injuries is undergoing treatment at the Chatrapati Prameela Raje Hospital at Kolhapur, while two others Avanish Datta Devadiga and Kapil Vittal Devadiga who too were in the car were lucky enough to escape without any injury. The family had left Brahmavar on Monday evening. It is learnt the car was speeding on the Highway when the mishap took place. The vehicle was totally mangled due to the impact of the collision. The family had also taken along its dog in the car and the poor animal which had survived the mishap was seen shedding tears for its near and dear ones who lost their lives in the mishap. Haw sad a major accident killing 4 of a family. You yourself never risk the life of the family. Do the best leave the rest. The state of the car seems to be worst. Very sad, even a child died in the mishap. RIP to all the deceased due to the accident .